If you have problems watching a live or archived United Church of God or Beyond Today webcast please refer to the points below. 1. The video is choppy or not playing smooth. 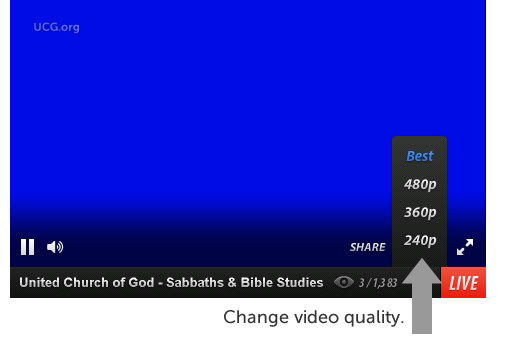 You may need to change the video quality within the Ustream player for a better viewing experience. 2. I don’t hear any sound and I know my speakers are working and turned on. 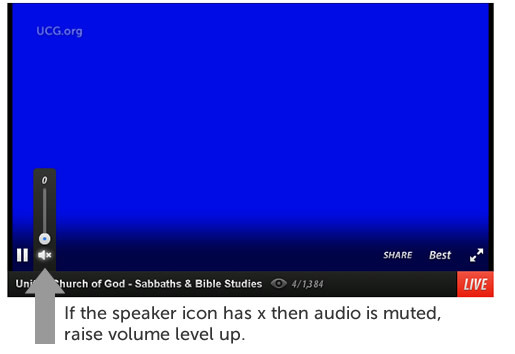 The Ustream video player may be muted. Unmute the audio inside the player and choose the volume level. 3. 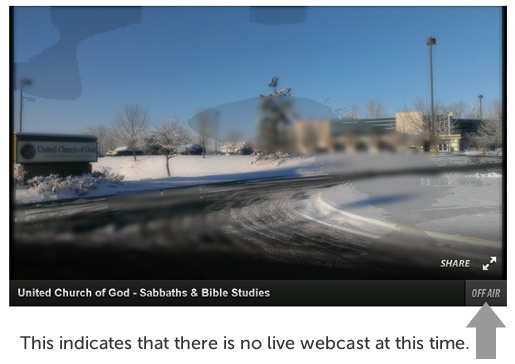 If the video is “Off Air” then there is no live webcast to view at the time. There maybe other videos to view or there might be a slideshow of various Homeoffice photos. 4. The red “LIVE” indicates that there is a live-webcast event happening and you can view it now. 5. 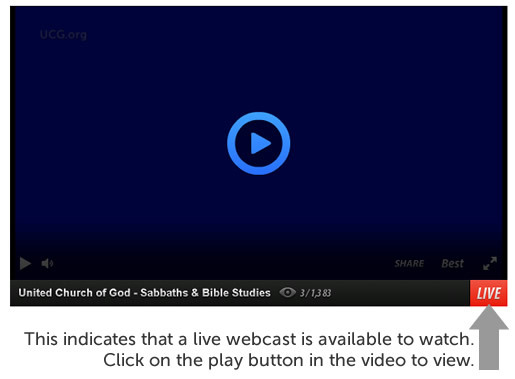 The “Recorded Live” indicates that you are watching an archived webcast. If you are experiencing any issues watching content on Ustream, please read the problems and solutions at this link . If you need additional video help, please visit the Ustream support website . Many of the videos offered on this website are hosted at YouTube and embedded on the ucg.org website. Here are some suggestions on how to improve the video quality of these on-demand videos. If you have problems viewing the video, try changing the video quality by selecting the “gear icon” [lower right-hand side of YouTube video] and choose another lower video quality (Example: 720p HD to 360p). 2. Reduce the amount of applications opened on your computer. You might need to close and exit out of other software that is opened on your computer. You should also close other browser windows or tabs. If you have another Web browser installed on your computer, copy the webpage where the video is located and try watching the video on this different browser. You might need to update your Flash Media Player to properly watch the video. 4. Try a newer computer with a faster processor. Sometimes the computer you are using may just be too slow to process the video for playback. This might happen if you are using an older computer. YouTube suggests these system requirements to watch YouTube videos. If you are watching one of our United Church of God or Beyond Today videos hosted at YouTube then consider these requirements from YouTube. 5. Problems with ISP (Internet Service Provider). A problem might be occurring with your ISP and the Internet connection you are using is not working properly or as fast as it should. If this is the situation, then you may want to check your Internet connection speed. If you are having problems with your Internet connection then you will need to contact your ISP. How can I check my Internet Speed? You can use a website called Internet Speed Test or Google Speed Test . This will tell you how fast your upload and download speed is. 1. Make sure the audio settings on your computer are turned on or that the volume setting is not on mute. Double-check that your volume works by listening to any audio files on your computer. 2. Make sure that the audio setting in the YouTube video is not turned off/muted. You will see an “x” by the speaker icon in the bottom left (next to the play button) of the YouTube video. If you see the “x” by the speaker, place your cursor over the speaker and adjust the volume slider to the right (see images below). Common Questions and Answers available at the YouTube Support website. Why does the video keep stopping and starting while I’m watching it? How do I change video quality? Can I watch YouTube videos with a Dial-Up connection? The videos images (screenshots) that appear after you watch a YouTube video are called “related/suggested or up next videos”. These videos are from YouTube and are not from ucg.org (some might be ucg.org material). We have tried to prevent these “related videos” from showing by using the proper video embedd code from YouTube that removes “related videos” [adding “?rel=0” after the YouTube video link] . However, the code that YouTube provides does not seem to be working at this time [as of July 1, 2013]. We apologize for any confusion this may cause but we have to wait for YouTube to fix this problem. By using YouTube: we save money in the hosting of the video, make the videos easy to share with others and the videos are easier to find via search engines and YouTube’s video search. If you would like to know more about the “related videos” functionality please visit the YouTube support website.